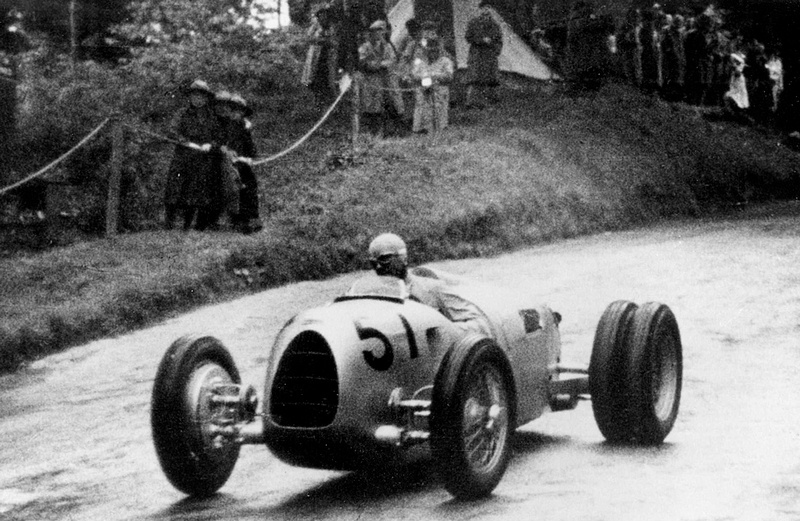 Goodwood's Festival of Speed this year will be remembered for being the first ever gathering of all the six wheelers that ever managed to get on the books of Formula one and that ever will, for that matter. This is because the latest of the trio, the Williams FW08B, finally managed to convince FIA to ban this bizarre approach for good in 1983. 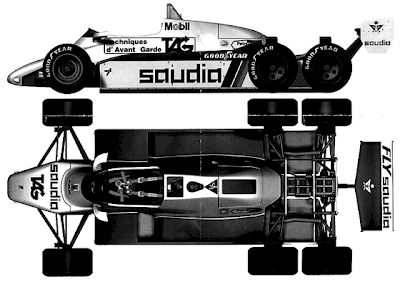 This happened right after news about the car started to spread and the FW08B became yet another F1 car that would have never raced. 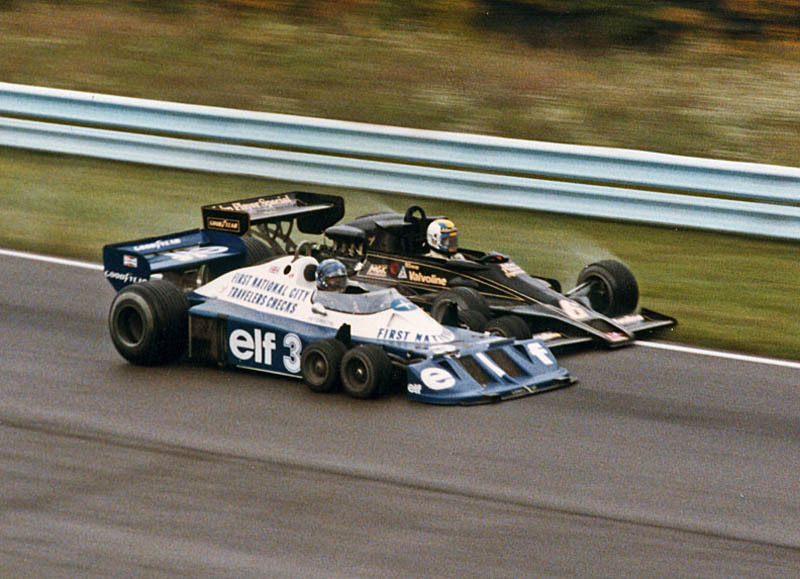 Williams decided that the best way to have a go at this idea was to put the extra two wheels at the very back of the car, adding an extra axle behind the rear wheels to help the car delivering power to the ground. 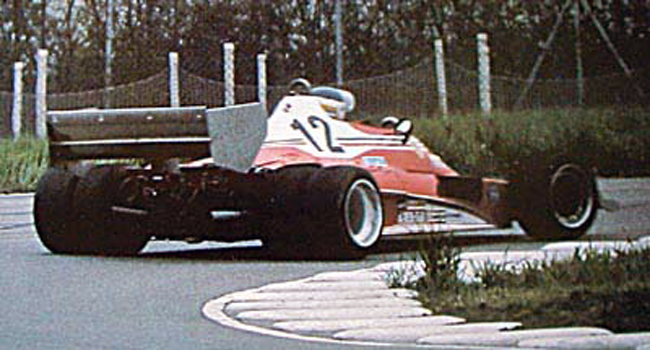 This was March's approach in its 1977's 2-4-0, yet another car that didn't effectively make it to the race track. It sure was and enormous advertising success, getting two covers of Autosport magazine respectively in December '76 and February '77. All this just thanks to two testing days at Silverstone, only 14 miles away from March's workshop. Everybody knows that Enzo Ferrari knew how to keep pressure on the media and it is hence unsurprising that Maranello had to have a shot at it. They decided to put two extra front wheels on the rear axle. 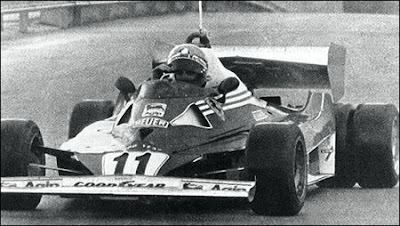 The car was tested at Fiorano by Lauda and Reuteman, the latter would end up crashing the newborn 312T6 on the 12th lap of the second testing, the car burnt to the ground. The desired effect on the press didn't give enough satisfaction and italian magazines started to speculate on the picture of a mysterious car this time sporting 8 wheels, 4 in the front and 4 in the back. 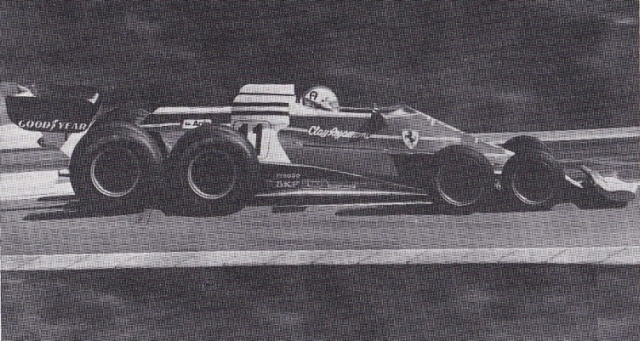 The car was immediately named the 312T8. Now look carefully at the extra wheels in the picture. Can you spot the hoax? Cunning. 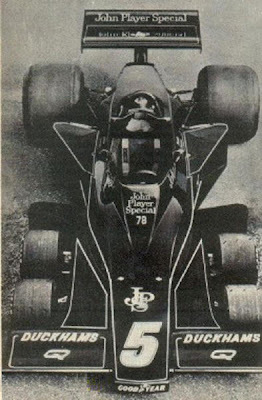 Something similar was attributed to Lotus the year before when this picture appeared on a belgian magazine but the date was more than a giveaway. It was the 1st of April. I won't comment further about the following side shot taken the following year. It is pretty obvious what's going on there. It's interesting how the first ever six wheeler F1 car would have also been the only one to ever race and with with decent results too. The Tyrrell P34 in fact was the only one of the lot with four wheels at the front and raced in '76 and '77 counting 30 races 1 win, 1 pole and 3 fastest laps. This is obviously the most famous six wheeler ever and the story of this car is very easy to find everywhere, I see no point in talking about it here. 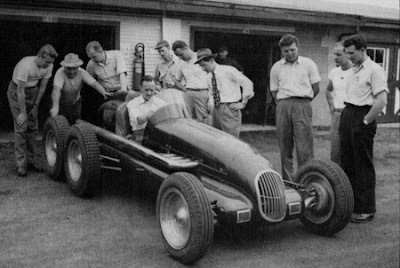 March's and Williams layout was tried before by Pat Clancy on his "Special" in the 1948 and 1949 Indianapolis 500s. Clancy was a dirt track driver and owner of a little trucking company, you can start to understand where he got the idea. He built the car in his garage and he did manage to qualify in both attempts. Successful? Nope. 12th in '48 and DNF in '49. 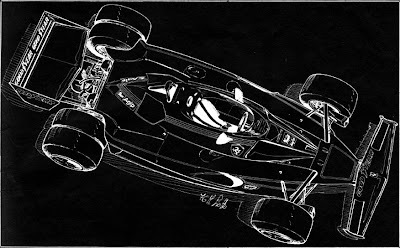 Whatever he was gaining in the straights was hopelessly lost in the curves in which the car was desperately trying to keep going straight. 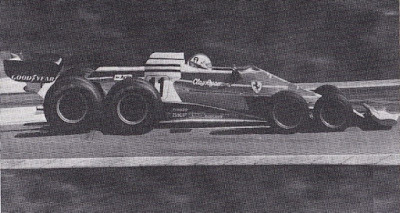 Ferrari's "rear sandwich" has been used in many occasions across the twenties and thirties especially when lending GP cars to hill climbs, not at all unusual at the time. This picture shows an Auto Union Type C but I do remember seeing this solution on an ERA, a Frazer Nash and a Maserati even after WWII. The six wheels solution has been also studied in land speed record vehicles like the now lost 1937's Thunderbolt or 1939's stillborn Mercedes T80. 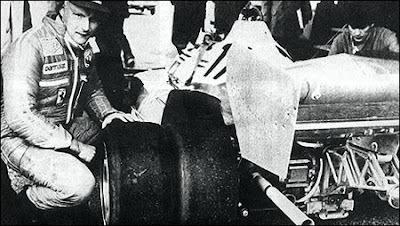 Both cars became victims of the second world war. The Thunderbolt was in New Zealand for an exposition when the war exploded. It will be left in a barn for years until a fire burned the building to the ground. The vehicle probably scrapped like any other piece of metal. 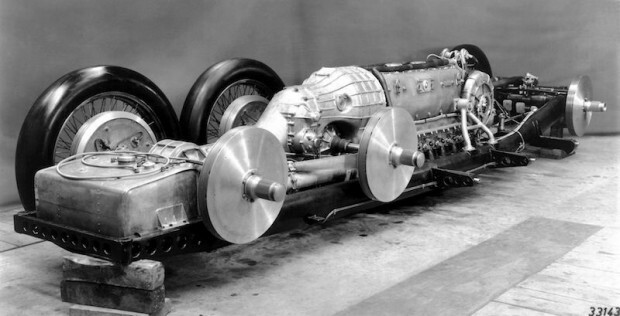 Ferdinand Porsche designed the Mercedes T80 to be equipped with a 44.5 litre Daimler-Benz DB 603, an increased displacement derivative of the aircraft engine which powered the Messerschmitt Bf 109. 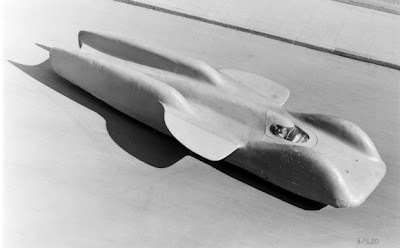 With its skillful engineering, advanced aerodynamics and the engine's 3000 hp it was expected to reach a projected speed of 750 km/h (465 mph). War struck and it never ran a mile. Funny enough the most recent attempt to my knowledge came from the World Rally Championship. In 1984 rear wheel driven Lancia 037 was struggling to defend its throne of world champion from the unstoppable rise of the unlimited and fearsome 4WD Group B cars. It did manage to tackle Audi's Quattro and Peugeot's 205 T16 for over a year but halfway into '85 the battle was obviously about to be lost forever. 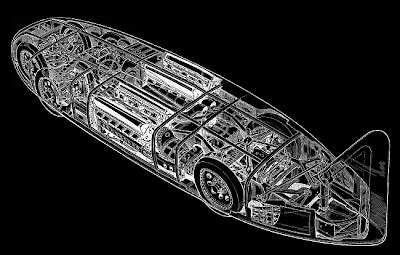 In a last attempt to try the unthinkable Lancia's engineers tested extensively a "rear sandwich" layout but as Peter Collins writes in his book about this fearsome car "they showed no vantage at all". The tires for this experiment were courtesy of Goodyear (not the usual Pirelli, also a main sponsor) and is is pretty clear that it was all a stunt in order to distract from the development of the 038, aka the Delta S4, that was being tested in great secrecy. They got to the extreme of painting the prototype in camouflage colours and have the test driver dressed in olive green too! So at the end of the day the only layout that proved any real benefit is Tyrrel's with its T34 and it is interesting to notice that no one ever tried to emulate it, being interested in the extra two wheels to create a stir rather than anything else, really. Of course using this layout there's 2004's Covini C6W but this car has no racing history and is in my opinion really really ugly. My apologies to Covini.